Jay Yarow joins from Business Insider. CNBC has named Jay Yarow executive editor for CNBC Digital. 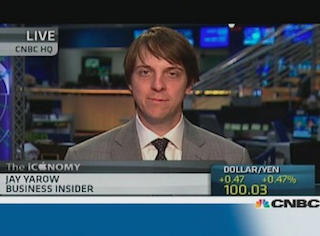 Yarow comes to CNBC from Business Insider, where he has worked since 2007. He most recently served as BI’s executive editor. In related news, Jonathan Meyers has been promoted to CNBC Digital’s senior vp, strategy and operations.